Investigate the background of the Black Dragon. Count Carolus still owes us what he promised for taking on his contract—information concerning the Black Dragon. Astara wants to find out what the Count knows. Speak to Astara and receive the instructions. Talk to Mirabelle to get additional information. (Optional) Inform Astara about Mirabelle's plans. Head to Dasek Moor to talk to Count Carolus. Enter the Enclave of the Hourglass and search the place. Talk to Lyra and search the Black Dragon's chambers. Return to the Sanctuary to inform Astara of the events. "Ah, you just missed Mirabelle. She was heading back to the Sanctuary in such a hurry we barely had time to talk." Why was Mirabelle in such a hurry? "I think she was on her way back from a scouting mission. Something to do with Count Carolus of Kvatch, as far as I could ascertain. Mirabelle mentioned she had to convince Astara and then she was off, heading in the direction of the Sanctuary." Mirabelle was spying on the Count? "Spying? Scouting? When you think about it, is there really any difference? Oh, I almost forgot. Astara was asking about you. I'd return to the Sanctuary and see what the Matron wants, if I were you." I'll head to the Sanctuary and speak to Astara. Astara: "You're too close to this one, Mirabelle. Besides, the Speaker has already decided." Mirabelle: "Too close?! They killed Cimbar, Astara. I'm going to be a part of this whether you give the command or not." "Assassin, it's time to collect a payment past due." Of course, Matron, but why was Mirabelle so upset? "Mirabelle's outburst doesn't concern you, Assassin. Focus on the task at hand. Count Carolus still owes us for the Sacrament. He claimed to have information about the Black Dragon. Meet him at the ruins of Dasek Moor and find out what he knows." Why does he want to meet at the ruins? "We're not sure, but that's where he requested to meet. He has a camp there which he's using for his own clandestine purposes. Before you go, talk to Mirabelle. She has information concerning the Count that could prove useful to your mission." I'll talk to Mirabelle before I head out. "Don't dawdle, Assassin. I gave you a job and I expect you to handle it." "Astara just gave you my mission, didn't she? Well, I can't say I'm surprised." Why didn't Astara give you this mission? "I'm not used to being ordered about by a clandestine organization, so let's get this over with. I'd prefer to conclude our business and forget all about that dreadful ritual I had to perform." It's time to pay what you owe. Tell me about the Black Dragon. "I already told your associate everything I know. The woman with the dark hair and the staff. Mirabelle, I think she said her name was. Do I really need to repeat myself to every assassin that slips out of the shadows?" "If that's supposed to frighten me, it's working. The Black Dragon is the First Sword of the Order of the Hour. They're using the old Enclave of the Hourglass to amass an army. Siege weapons, new recruits—it's a threat to your people and mine!" "If that's everything, I'd like to get back on my horse and return to Castle Kvatch. If I'm gone too long, I suspect Primate Artorius will go ahead and change all the locks." "Assassin! I hoped I might run into you here." "Saw right through that, didn't you? Astara didn't send me. That was a lie. I'm here without contract or permission. "Just one thing. I need to find the Black Dragon and make her pay for what happened to Cimbar. I heard her voice and I'd recognize it anywhere. Are you going to stand in my way?" Enter the Enclave of the Hourglass courtyard and interact with the two catapults inside, to set fire to them. There are Order personnel training here. Once you've dealt with the siege weapons, head inside the Enclave proper. In the foyer, you'll overhear a conversation between Lieutenant Vinicius and Captain Marie Elena, who are in the next room negotiating the induction of Red Sails personnel into the Order of the Hour. Together they comprise a single boss fight. If you sneak in and head to the right, behind a wall, you'll be able to creep up behind one of them and use the Blade of Woe, leaving you to fight the other on their own. Your next objective is to interrupt the Red Sails' initiation. 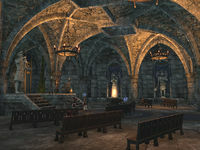 Head through a door to the Basilica of Eternity and continue until you see a number of Order and Red Sails personnel assembled around an elevated platform, where Chanter Collatinus declares, "Your past is forgotten as your new life for Akatosh begins. Honor to the Order." If you're stealthy enough, you can head around to the right, climb up some crates stacked up against the side of the platform, and use the Blade of Woe on the Chanter to complete the objective; however, this will get you attacked by somewhere around eight enemies, all at once. Kill them or flee as you prefer. Now, you must burn the pardons drafted up for the pirates. Head through the door to the Neglected Vestry and enter the first room to the right. You'll find Herminia Pevengius alone in the room with the pardons; deal with her as you wish, and then interact with the stack of pardons to burn them. Now, you must search the Enclave of the Hourglass for information on the Order or the Black Dragon. As you travel through the Enclave's hallways, you'll see Waarosh, a wamasu being kept by the Order. You have an optional objective to kill it. (What happens if you leave it alive? For that matter, what happens if you kill it? The objective didn't complete properly for this editor, likely due to a bug.) Your main objective, however, lies in a large, multi-floored room just past the wamasu, and as you step into the room, your objective will display above the compass: "Meet Lyra." "It seems you have me at a disadvantage. But you don't have to be afraid of me. Put away your weapons and I'll help you in whatever way I can." Tell me where I can find the Black Dragon. "The Black Dragon? How brave of you to seek the most powerful warrior in our order. I can show you where her chambers are, if you like. You know, the Black Dragon was a lot like you once, before she sought redemption." The Black Dragon was an assassin. A member of the Dark Brotherhood. Until she had enough of following the commands of others." "You're pretty good at that. Silence can be very intimidating. In the right hands, of course. Come. I'll take you to the Black Dragon's chambers and you can meet her yourself." "As I understand it, she was an assassin. She killed on command and with impunity, leaving a graveyard full of corpses in her wake. She's a member of the Dark Brotherhood. That is, she was. Until they pushed her too far." "Members of the Order are encouraged to talk about their pasts. But we should get to someplace more private. You don't want to get caught out in the open if more of the Order appears. I'll take you to the Black Dragon's chambers. We can talk there." Lyra will head to into a hallway, saying, "Stay close. The Black Dragon's chambers are behind that door. Follow me." Head through the door with her. You'll be tasked with searching the chambers, but the item you're looking for — The Black Dragon's Journal — is resting on a table, clearly indicated with an objective marker. Read it. After you read it, Mirabelle will appear on a ledge, while Lyra approaches you and the table. Mirabelle, whispering: "Psst! Assassin, up here! I'm waiting for the Black Dragon." Lyra: "Setting a trap for the Dragon, is that the idea?" Mirabelle: "Wait, who is that with you?" Lyra: "I am death, you silly fool!" Lyra, to you: "We'll meet again, assassin, and next time I'll be ready to deal with you!" 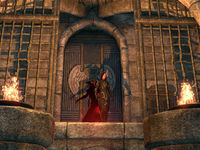 The Black Dragon will depart through the same door that Mirabelle entered, leaving the assassin to die. Mirabelle: "Don't mourn for me, assassin... I have always dreamed... of the Void... I'll see Cimbar... and the Dread Father soon... but you need to warn Astara. The Black Dragon... is..."
With Mirabelle dead and that sentence left unfinished, you should now return to the Sanctuary. An objective marker will indicate a convenient exit, leading to the shoreline south of the Enclave of the Hourglass. Turn around, and you'll see a path to your left, which you can follow to a nearby wayshrine. "So, Assassin, was the Count's information worth all the trouble he put us through?" The Count told me that the Black Dragon is the First Sword of the Order of the Hour. "The Black Dragon is one of the Order? That puts everything she's done to us in a new perspective. What else did you uncover?" The Order of the Hour is using the Red Sails pirates to bolster its numbers. "The Grand Sermonizer, the Chanters, now an army of religious warriors. It seems the priests of Akatosh have declared war against the Dark Brotherhood. Were you able to learn anything else about the Black Dragon?" The Black Dragon and the Order have turned the old Enclave of the Hourglass into a headquarters. "So the Count was using the ruins of Dasek Moor to spy on the Order of the Hour? Now if only we had some idea as to who's inside the Black Dragon's armor." She's a woman named Lyra. She may have been a member of the Brotherhood. I recovered her journal. "One of our Brothers and Sisters? I don't recognize the name, but there are other Sanctuaries. Why would our Sister hunt us? And why work for the Order of the Hour? Where's Mirabelle? I need her to do some digging ...."
Mirabelle's dead. The Black Dragon killed her. "You encountered the Black Dragon? And you survived? But Mirabelle ... why was she even there? I knew her recklessness was going to get her killed. And now we face a greater threat. For all that you learned, there's still so much we don't know." I was able to stop the Order from initiating more of the Red Sails. "Well, that's something at least. I just wish we hadn't lost another Sister along the way. That's enough for now, Assassin. Speaker Terenus and I have much to discuss." Terenus will approach and speak to Astara and Green-Venom-Tongue. Astara: "The Black Dragon has struck again. Mirabelle is dead." Terenus: "This happened during the Assassin's mission? Did we learn anything, or did Mirabelle die in vain?" Astara: "We learned that the Black Dragon is the First Sword of the Order of the Hour. We recovered her journal, and discovered her true name: Lyra." Green-Venom-Tongue: "Lyra? Hmm. Allow me to study the journal, and its secrets will be revealed." Astara: "I can't think of anyone better for the task, Brother." Green-Venom-Tongue: "I'll dig into the Black Dragon's journal immediately." Terenus: "See that you do." Notably, Green-Venom-Tongue pronounces Lyra's name differently from the others. Before I head out to meet with Count Carolus, Astara asked me to talk to Mirabelle. She has information that might be of use to me when I meet with the Count. 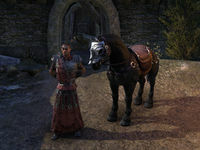 I need to meet Count Carolus south of Kvatch, in the ruins of Dasek Moor so that he can fulfill his obligation and tell us about the Black Dragon. 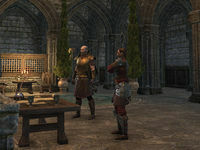 Count Carolus revealed that the Black Dragon is the First Sword of the Order of the Hour, and that the Order has once again occupied their old enclave outside of Kvatch. I should go there and investigate. I entered the Enclave of the Hourglass and walked in on a meeting between one of the Red Sails captains and an officer of the Order of the Hour. I should put an end [sic] their negotiations. Apparently, a group of Red Sails pirates is about to be initiated into the Order of the Hour. If I can stop the initiation, I can keep the Order from growing and gaining more recruits. I disrupted the initiation. Now I should look around and try to find the Black Dragon or any information that will give the Brotherhood an advantage against the Order's First Sword. Finishes quest I should return to the Sanctuary and tell Astara what transpired at the Enclave of the Hourglass. I should also turn over the journal I recovered from the Black Dragon. This page was last modified on 21 September 2018, at 15:55.